Intake stroke, gasoline vapor and air drawn into engine ( ). Compression stroke, , increase ( ). 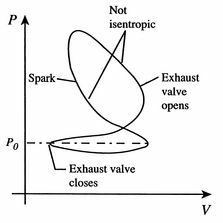 Combustion (spark), short time, essentially constant volume ( ). Model: heat absorbed from a series of reservoirs at temperatures to . Power stroke: expansion ( ). Valve exhaust: valve opens, gas escapes. 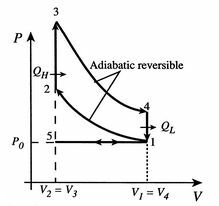 ( ) Model: rejection of heat to series of reservoirs at temperatures to . 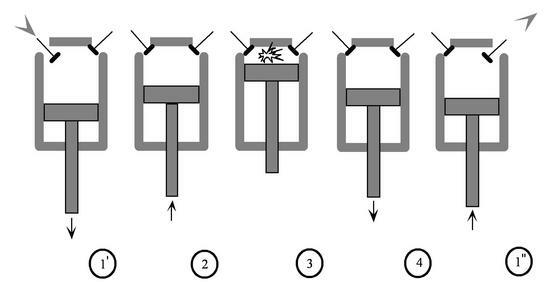 Exhaust stroke, piston pushes remaining combustion products out of chamber ( ). We model the processes as all acting on a fixed mass of air contained in a piston-cylinder arrangement, as shown in Figure 3.10. The actual cycle does not have the sharp transitions between the different processes that the ideal cycle has, and might be as sketched in Figure 3.9. The ideal Otto cycle efficiency is shown as a function of the compression ratio in Figure 3.11. 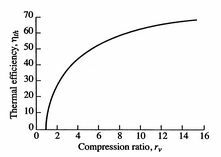 As the compression ratio, , increases, increases, but so does . If is too high, the mixture will ignite without a spark (at the wrong location in the cycle). is the fuel mass flow rate.